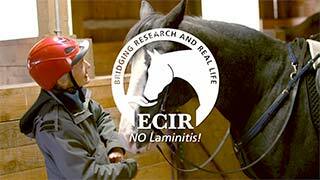 Realigning Trim | ECIR Group, Inc. Founder can be capsular rotation, bony rotation, or often a combination of both. It frequently can be hidden by simply misreading the shape and proportions of the hoof capsule. Photo 1 is the foot of an insulin resistant, laminitic horse that had consistent hoof care. Even with correct diet in place for many months, the horse continued to be lame. 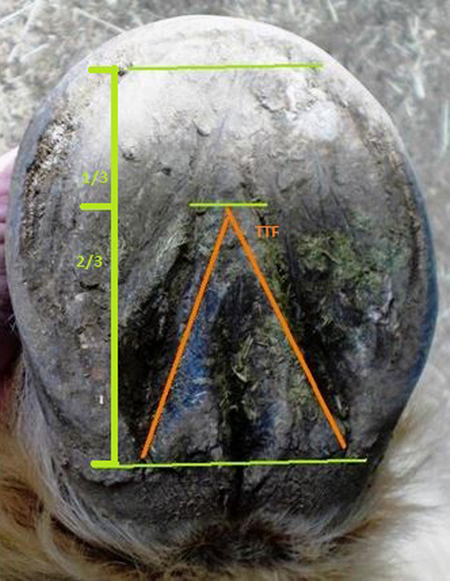 By understanding the basic proportions of the foot, one can see that the toe and frog are stretched and can take appropriate trimming measures to start the realignment of the hoof capsule with the coffin bone. In photo 2, lateral assessment of this same foot also shows the long toe. The upper third of the wall is aligned with the current position of the coffin bone. There is a point of angle change in the toe wall (black arrow), classic with a history of founder. One fundamental aspect of the realigning trim backs the toe so that it is in line with the current position of the coffin bone (purple line). This reduces the pull or leverage on the lamina during break over by allowing the coffin bone to break over correctly. This does not mean to rasp, and thus thin the wall all the way up for alignment with higher wall (along the green line). By starting with backing the toe from the top with the toe on a stand, and with frequent, often weekly trims, the hoof care professional can start to smooth and blend the wall as it grows down. Radiographs in photo 3 confirmed the long toe flare which perpetuated the capsular rotation (green lines). The degree of separation between the coronet band and the extensor process (orange lines) demonstrates a moderate amount of distal descent. It is probable that the diminished support by the out-of-balance hoof capsule in relation to the coffin bone was enough to allow the bony column to descend. Bony rotation is demonstrated by the bones having shifted out of the correct relationship with the ground and each other. 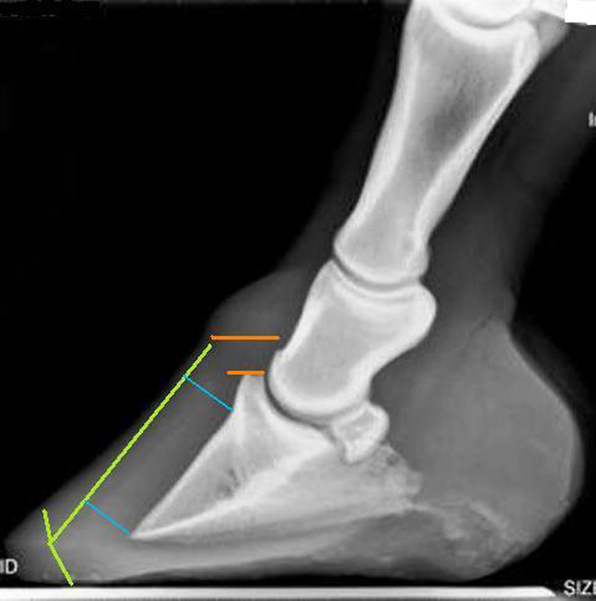 Capsular rotation involves the hoof capsule being out-of-balance with the bony column. A hoof can have either, neither, or both. 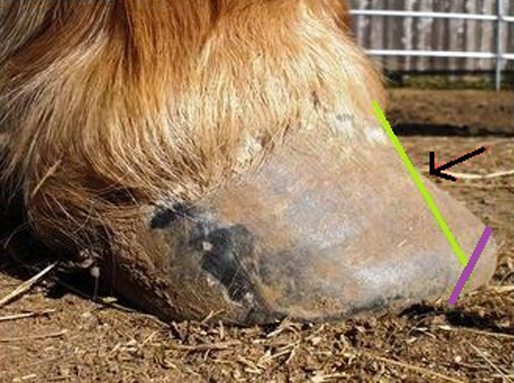 The hoof in Photo 4 demonstrates both bony and capsular rotation. In a healthy foot, the palmar angle, or back of the coffin bone (yellow arrow), usually sits at about 5 degrees (+/-) to the ground. The bony column is aligned (orange), with no knuckling forward (pink) or dipping back. 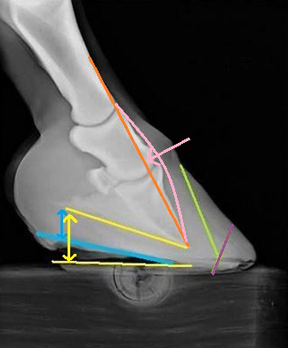 By lowering the heels to the blue line, another fundamental aspect of a realigning trim with bony rotation, the bones will be "derotated" (pink arrow) and the palmer angle returned to about 5 degrees (blue arrow). It usually happens as quickly as that. The capsular rotation can be addressed by backing up the toe to rid the foot of the toe flare (purple line). The realigning trim is just the start. It can take up to a year for the hoof capsule to totally grow out and be replaced with a new one. Overall healing takes time as well. Appropriate comfort and overall support measures can be boots/pads, taped on construction grade styrofoam or anti-fatigue matting cut to the shape of the foot, casting over pads, casting over packing, or glue-on appliances. These allow relatively easy- to very-easy access to the hoof for the necessary frequent touch ups of the trim.